You’re probably already well aware of my preppyish tomboyish inclinations. I’ve never met a monogram or a penny loafer that I didn’t like, but as I survey my fall wardrobe, I have a glaring omission that you will probably be surprised to learn. Every time fall rolls around, I say to myself (and whoever might be listening), “Man, I really need a navy blazer with gold buttons”…and then nothing happens. Every year. I’m not sure why. 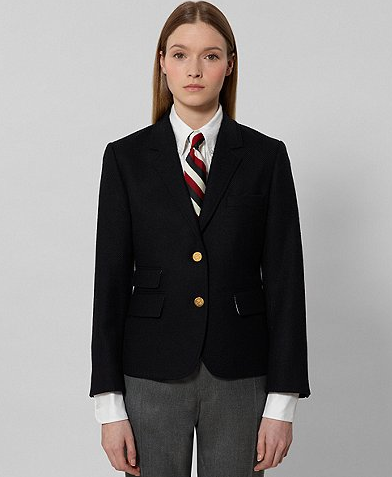 An iconic prep staple, if ever there was one, the navy blazer will figure largely for me this fall. It must be wool, it must have gold buttons, but I’m flexible on whether it is double or single breasted. I’ve collected a few candidates on my Svpply. Which one do you prefer? Cheapest option, but a bit too much on the shrunken side. Really like the contrast collar, but I’m not a collar-popper. Are those cuff buttons functional? Generally like, especially the lapels, but will I tire of the crest? Oh Brooks Brothers, take me to Yawnsville. Liking these lapels and this crest less than the other RL blazer. Uff!! Thom Browne, you are so so good. Hate the way they styled this. Very much like how it manages to be double-breasted and not too boxy. Perfection. Well, except for the price tag. My mom randomly found me a very nice shrunken navy blazer for $6 at a thrift store (go mom! )- I think I’m going to get out my trust needle and thread and swap out the buttons! Thanks for the inspiration! Ooh, even better Shelly. Would love to see the finished product! 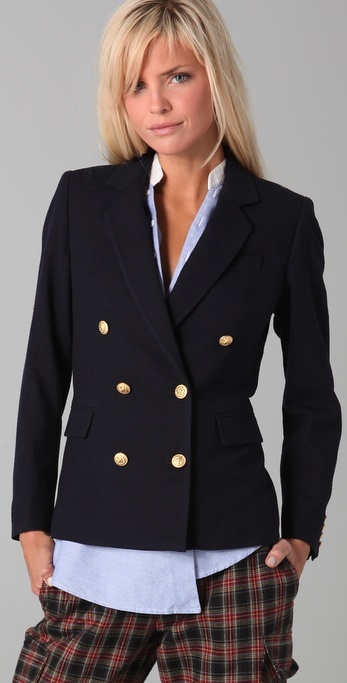 Navy blazer with gold buttons…my best purchase of 2011 thus far! Nice! Do tell, where did you pick it up? Loving the Rugby Little Boy. Even though you may not be a “collar popper”, its always nice to know you would have the option for a little extra flavor in the event the need arises! And the gold buttons on that one are pretty fab. I’d go for either J. Crew or Rugby Little Boy. 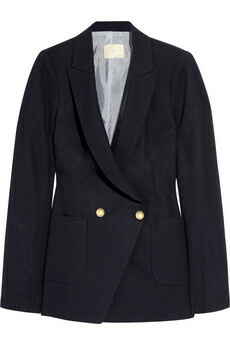 You are currently reading Wants: Navy Blazer x Gold Buttons at Quite Continental.